If you need a quick, easy and delicious treat, this one takes a Chocolate Dutch Baby and uses it as the base for a delicious Sundae! And all in 20 minutes and with only one bowl! That said, I don’t want let the day go by without a little something. 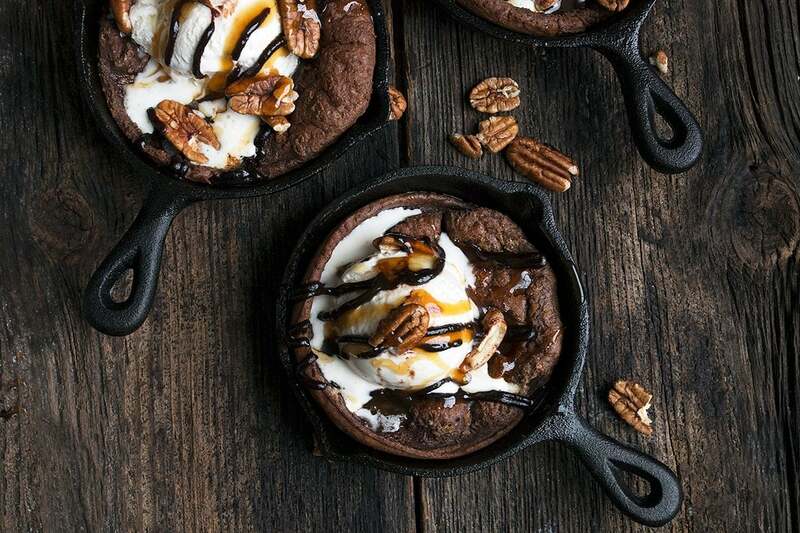 So enter these Chocolate Dutch Baby Sundaes. They are dead easy, they’re made with basic pantry items, they cook up quickly and of course, they’re chocolatey delicious :) A perfect “little something” for Valentine’s. Top your chocolate dutch baby with ice cream or whipped cream. Add a little chocolate and/or caramel sauce or get creative with what you have on hand with chocolate chips or shavings, sprinkles, cherries, toffee bits or whatever! Of course it goes without saying I think, that an easy and delicious chocolate Dutch baby is a good idea on more than just Valentine’s Day. 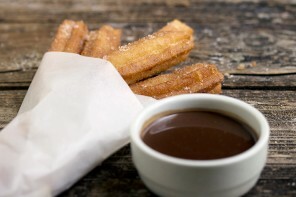 Tuck this easy recipe away for whenever the need for a warm chocolate treat arises. I made individual chocolate Dutch babies in my small 5-inch cast iron skillets. The recipe as written will make 3 at that size. Using the same recipe, you could make one in a 6.5-inch skillet or make 5 or 6 tiny ones using a standard muffin tin. If you’d like to make one big one in a 10-inch (top diameter) skillet, simply double the recipe. Enjoy these warm from the oven, but do be careful of the HOT handles if using cast iron skillets. 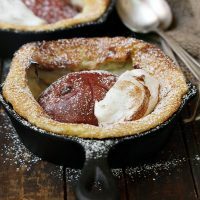 Easy and delicious, these individual chocolate dutch baby pancakes can be made in small skillets, muffin tins or double the recipe to make in a 10-inch (top diameter) skillet. Place skillets into oven and then preheat oven to 425F with skillets in oven. Meanwhile, combine all the batter ingredients in a medium bowl and whisk well until fluffy. Set aside. When oven is preheated, carefully remove skillets from oven (they're hot!). Add 1 Tbsp of butter to each skillet and swirl around to coat as it melts. Give batter a quick whisk, then divide evenly between the 3 skillets. Immediately place into preheated oven and bake until puffy and set, about 10 minutes (for 5-inch skillets). Remove from oven. Pancakes will deflate as they cool. While still warm, top with a scoop of ice cream, chocolate and caramel sauce and a scattering of pecans. If making in a muffin tin, baking time will be slightly less, about 8 minutes. If doubling recipe and baking in a larger skillet, baking time would be 15-18 minutes. 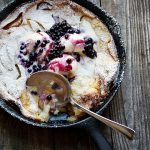 A classic combination of peaches and blueberries, together with a delicious dutch baby. Comfort food at it's best. 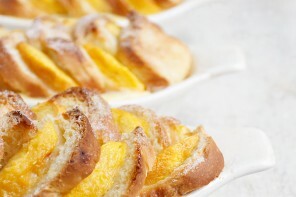 Serve with ice cream for a great dessert or skip the ice cream for a great brunch dish. 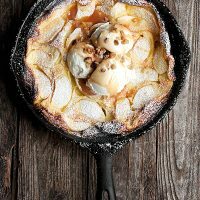 If you love cooked pears, this Dutch baby is a must make! Okay, well I just bought some of these mini skillets! They’re so cute! My husband would love this for a special dinner, with all of the goodies on top. And I’m a sucker for a good Dutch baby! Thanks! 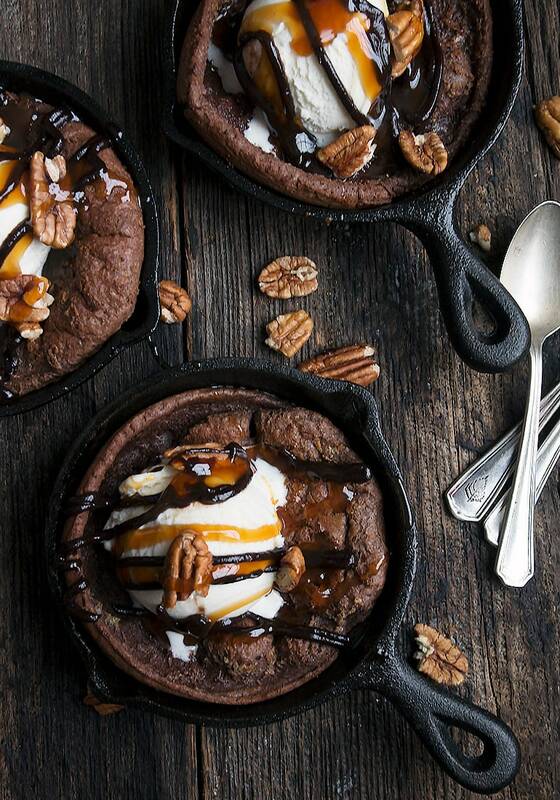 These mini skillets are everything! So cute and this looks so decadent for any day of the month. Can you tell I love chocolate? So adorable, these are the perfect little sundaes! So very true about celebrating holidays WAY in advance, Jennifer!! 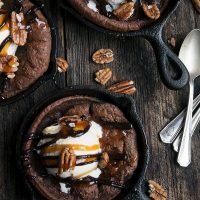 The hubs and I our having our (second) Valentine’s Day celebration this weekend and these mini Chocolate Dutch Baby Sundaes are just perfect!!! Absolutely brilliant, dear! Cheers! I love desserts in mini skillets Jennifer. I’m always trying to break mine out! These have stolen my heart! Oh my, this doesn’t look quick and easy but I love that it is. It looks like it came from a fine restaurant! I am seriously crashing on these cute little skillets! So inviting:) Chocolate + ice cream = love. Haha! 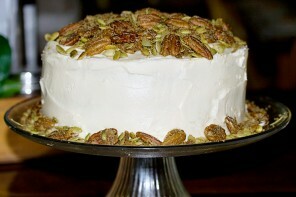 I totally know what you mean where we are ahead of the whole blogging schedule :) This looks amazingly good, Jennifer! 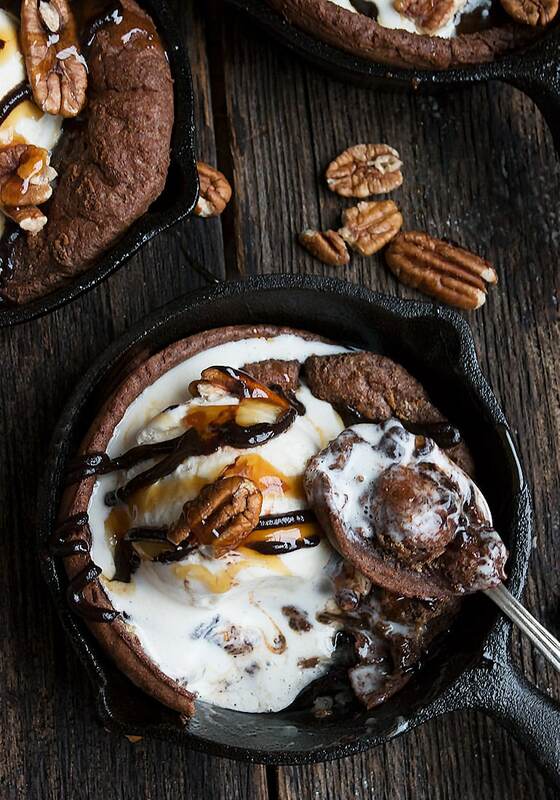 Skillets are my fave, especially those with desserts in ’em! Hubby and I are staying home with fur baby tonight cause it’s his birthday and making something special this weekend. I would love to add this to the menu! Happy Valentine’s Day!